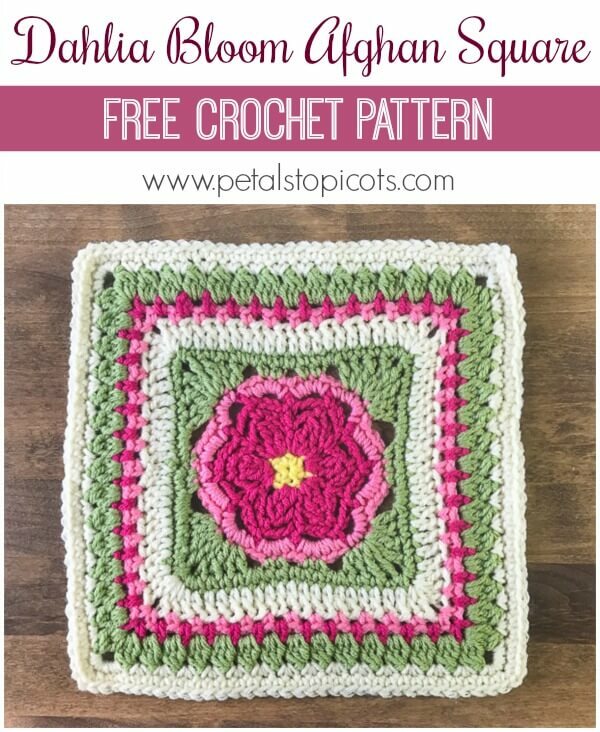 I designed this Dahlia Bloom Afghan Square crochet pattern, along with my Aubrieta Bloom Afghan Square Crochet Pattern, to crochet into a larger garden inspired afghan and I must say they go very nicely together!! 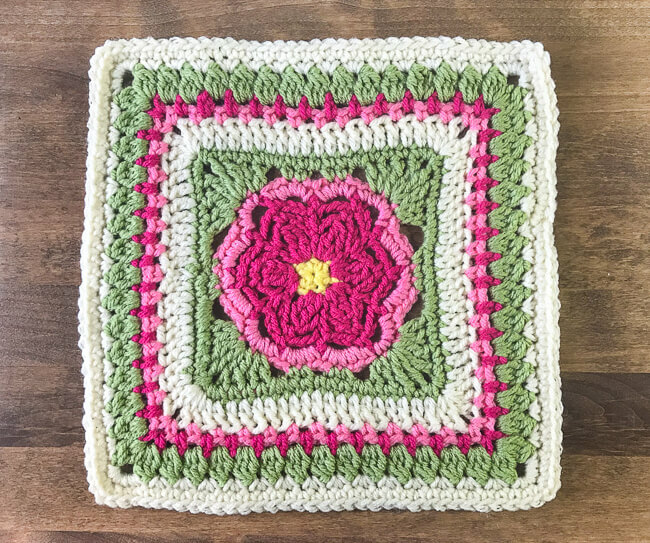 The Dahlia Bloom Afghan Square is a 12-in. afghan square worked up in 5 colors of worsted weight yarn. I can already imagine all the lovely color combinations you will make! 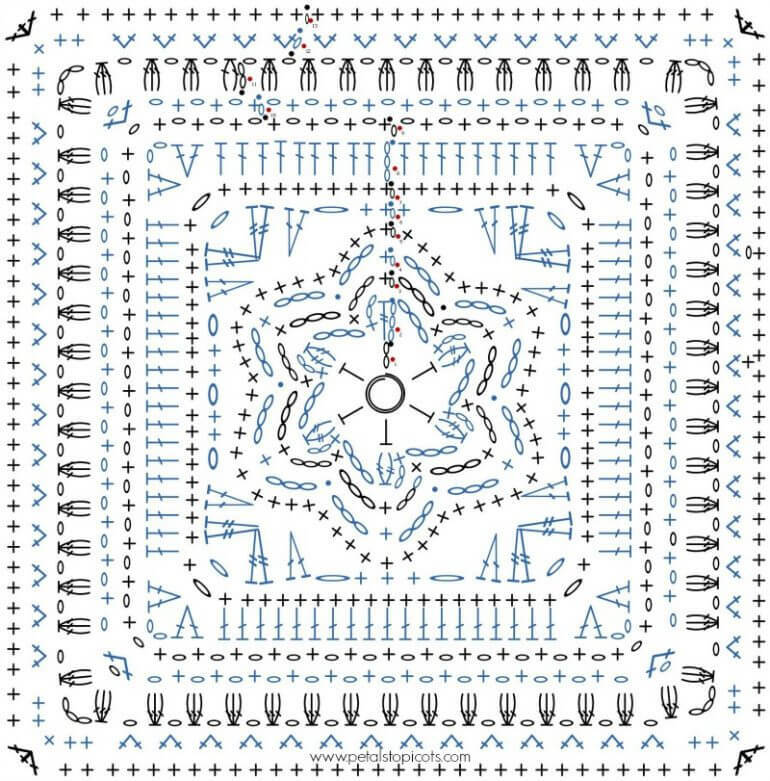 I have included a stitch diagram along with the written pattern for those of you who prefer to follow along in a more visual way. Hope you enjoy working it up as much as I did! Available as a convenient, ad-free and printer-friendly pdf download here. With CA make a magic ring (as an alternative to the magic ring, you can ch 4 and join with a slip stitch in furthest chain from hook to form a ring). Round 1: Ch 2 (counts as hdc), work 5 hdc in ring, join in first hdc and fasten off – 6 hdc. Round 2: Join CB in same st as join, ch 3, work (1 tr, ch 2, 1 sc) in same st, ch 3, *(1 2tr-cl, ch 2, 1 sc) in next st, ch 3, rep from * around, join in first tr – 6 cl-sts, 6 sc. Round 3: Ch 1, work 1 sc in same st as join, ch 3, 1 sc in next sc, ch 3, *1 sc in next tr-cl, ch 3, 1 sc in next sc, ch 3, rep from * around, join in first sc – 12 sc. Round 4: Ch 1, work 1 sc in same st as join, ch 3, Sl st in next sc, ch 3, *1 sc in next sc, ch 3, Sl st in next sc, ch 3, rep from * around, join in first sc and fasten off – 6 sc, 12 ch-3 sp. Round 5: Join CC in same st as join, ch 1, work 1 sc in same st, work 4 sc in each of the next 2 ch-3 sp, *1 sc in next sc, 4 sc in each of the next 2 ch-3 sp, rep from * around, join in first sc and fasten off – 54 sc. Round 6: Join CD in same st as join, ch 1, work 1 sc in same st, 1 sc in next st, ch 1, sk next 4 sts, *2 dc in next st, (2 tr, ch 1, 2 tr) in next, 2 dc in next, ch 1, skip next 2 sts, work 1 sc in each of the next 2 sts, ch 1, skip next 2 sts, work 1 sc in each of the next 2 sts, ch 1, skip next 2 sts, 2 dc in next st, (2 tr, ch 1, 2 tr) in next, 2 dc in next, ch 1, sk next 4 sts,** work 1 sc in each of the next 3 sts, ch 1, sk next 4 sts, rep from * to ** once more, 1 sc in last st, join – 46 sts, 14 ch-1 sp. Round 7: Ch 1, work 1 sc in same st, 1 sc in next st, 3 sc in ch-1 sp, *1 sc in each of the next 4 sts, (1 sc, ch 1, 1 sc) in corner ch-1 sp, 1 sc in each of the next 4 sts, 2 sc in ch-1 sp, 1 sc in each of the next 2 sts, 1 sc in ch-1 sp, 1 sc in each of the next 2 sts, 2 sc in ch-1 sp, 1 sc in each of the next 4 sts, (1 sc, ch 1, 1 sc) in corner ch-1 sp, 1 sc in each of the next 4 sts, 3 sc in ch-1 sp,** 1 sc in each of the next 3 sts, 3 sc in ch-1 sp, rep from * to ** once more, 1 sc in last st, join and fasten off – 76 sts, 4 ch-1 corners. Round 8: Join CE in same st as join, ch 3 (counts as dc), *work 1 dc in each st to next corner ch-1 sp, [2 dc, ch 2, 2 dc] in ch-1 sp, repeat from * around, join in top of beginning ch and fasten off — 92 dc. Round 9: Join CB in same st as join, ch 1, work 1 sc in same st, ch 1, skip next st, *+1 sc in next, ch 1, skip next st, repeat from + to corner ch-2 sp, [1 sc, ch 1, 1 sc] in corner ch-2 sp, ch 1, skip next st, repeat from * around, join in first sc, fasten off CA and weave in ends — 52 sc and 52 ch-1 sp. Round 10: Join CC with a Slip st in next ch-1 sp, ch 1, work 1 sc in same ch-1 sp, ch 1, skip next st, *+1 sc in next ch-1 sp, ch 1, skip next st, repeat from + to corner ch-1 sp, [1 sc, ch 1, 1 sc] in corner ch-1 sp, ch 1, skip next st, repeat from * around, join in first sc, fasten off CB and weave in ends — 56 sc and 56 ch-1 sp. Round 11: Join CD with a Slip st in next ch-1 sp, ch 2, work 2dc-cl in same ch-1 sp, ch 1, skip next st, *3dc-cl in next ch-1 sp, ch 1, skip next st, repeat from * to corner ch-1 sp to [3dc-cl, ch 3, 3dc-cl] in corner ch-1 sp, ch 1, skip next st, repeat from * around, join in first cluster st, fasten off CC and weave in ends — 60 cluster sts and 60 ch sp. Round 12: Join CE in same st as join, ch 1, *work 2 sc in each ch-1 sp to corner, work 5 sc in corner ch-3 sp, repeat from * around, join in first st — 132 sc. Mix and match with my other 12-in. afghan square designs! These squares are beautiful. I hope that I can put them together and have them just as lovely. I have been reading patterns for years and appreciate the two pattern instructions! IF needed, one can visually clear up my confusion in reading the other. Thank you for being here with creative, lovely patterns.